Do you know SSD hosting can help you get high server performance and incredible website loading speed? Do you know choosing the right SSD web hosting is one of the crucial things to improve your site’s loading time? And the best thing is you don’t have to spend too much to avail solid state based storage plans. There are numerous companies who provide affordable and low-cost plans along with essential features such as free SSL certificate, free domain registration, and cPanel, etc. Some hosts even offer SSD plans at the same price compared to shared hosting. Personally, I am also using SSD host (SiteGround) for last 1.5+ years and upon testing website loading speed, I just surprised to found that it delivers two or three times higher performance than the traditional HDD hosting. Why will someone pay for outdated technology when he/she can choose SSD powered servers at the same price? I am sure, no one. Right? HDD vs SSD Hosting – What’s the Difference? The main difference between HDD (hard disk drive) and SSD (solid state drive) whether it’s local storage or hosting, HDD locate and store the data through the mechanical read/write header and disk rotation where SSD memorize the data electronically in integrated circuits. And there is no moving part involved that’s why you get 300x faster read/write speed compared to traditional mechanical drives. Plus, SSD’s are much reliable, safe, and produce low heat. SiteGround is one of the most innovative and fastest web hosting providers for all the major CMS such as WordPress, Magento, and Drupal. They have plans for all type of users ranging from beginner to advance. They are working since 2004 and successfully gained thousands of customer’s respect due to outstanding services. Now empowering more than 1 million domains globally and growing. WordPress.org also recommends them to build websites on WordPress platform which make more sense to use them. They have an in-house team of experts to innovate modern technology for better user experience, for example; their SuperCacher feature helps you improve site speed with the help of multi-level cache mechanism. All you have to do is install and activate the SG Optimizer plugin; it works out of the box. SiteGround also has own backup system and LXC container technology to protect your data from any incidence and keep an eye on servers pro-actively to address future problems thus make necessary changes to avoid them. All of the SiteGround plans come with SSD hosting and cPanel control panel (shared)- industry traditional software to manage your hosting account. You can activate the SSL (free) certificate through cPanel with just one click. There are also SuperCacher settings available to enable multiple cache levels like Static, Dynamic, Memcached, and HHVM cache. If site speed matters the most for you or wants to make your website loads quickly, then SiteGround is the best solution for you. Moreover, they have instant 24/7 customer support via live chat, call, and ticket system. It takes only a few minutes (usually 1 ~ 2 minute) to contact the support person and fix most of the issues during the chat. The customer support is friendly and tries their best to answer your queries as soon as possible. All of these features also covered by 30 day money back guarantee (no question) to protect your investment. However, you might be asked for the reasons to refund; this is because they do care user experience. For more in-depth details and thorough review, check this SiteGround review to learn more. There are many reasons to choose SiteGround; the company has various in-house technologies including exclusive cache mechanism that improves the performance dramatically. On the other hand, dedicated backup and monitoring system also in place which secure your contents and prevent unpleasing incidents. Plus, custom Linux container efficiently utilizes server resources to handle sudden traffic spikes and avoid downtime. InMotion offers the best money-value features and lightning fast SSD web hosting for all accounts with a free domain registration. Instead of registering the domain name at the time of purchase like most of the hosts do, you can pick the domain later according to your business model or blogging niche. They allow unlimited monthly bandwidth and storage so that you won’t get out of space anytime soon. The company is generous enough to offer two domains for the very basic package called “Launch” at no extra fees. However, “Pro” plan concede countless sites. So, if you’re managing multiple blogs and looking for reliable but affordable web hosting, choose InMotion without any doubt. They will freely migrate your data with ZERO downtime guarantee. Plus, unlimited email accounts and email storage is another edge. For ultimate possible speed, you can make use of Max Speed Zone data centers located in West and East coast. It ensures faster rendering, low latency, and unforgettable user experience as well as better SERP positioning. They have multiple data centers to deliver beyond the expectations performance across the world. Unlike many providers, you’ll get free data backup and restore feature whereas the competition charge restoration fee. Furthermore, to make things easier or help users accomplish what they want, there are more than 400 one-click installer scripts that can be used to install the desired software within a few clicks and doesn’t require technical skills. It clearly shows that the company’s primary aim is delivering more than the money you pay. And saying InmotionHosting is a well balanced money-value service won’t be wrong. Not convinced yet? Well, their 90 day refund policy might do the magic. IMH has a lot of things to offer such as Max Speed Zones for ultimate performance, free domain, unlimited free SSD hosting and bandwidth, 400+ applications, SSH access, Google Apps, WP-CLI, and 2 domains even for the basic “Launch” package. Surprisingly all of these features are backed by a whopping 90 days money back guarantee. GreenGeeks is a full-fledged cheap SSD hosting provider utilizing solid state drives for Shared, VPS, Reseller, and Managed WordPress servers. They provide one plan for shared hosting that allows unlimited domains on a single account. Even though their plans are highly affordable but still, you get speed optimized services backed by the cutting-edge infrastructure. The entire hosting network built on SSD’s so 99.9% uptime and fast rendering speed are guaranteed. New customer gets a lifetime free domain until they pay hosting bills which save dozens of bucks in a long run. With that said, if you choose 3-year membership, it’ll easily save you $36. You can select from various data centers such as Phoenix, Chicago, Montreal, and Amsterdam providing diverse locations for improved data fetching and fast loading. On top of that, RAID-10 arrays boast foolproof data protection and maximum redundancy. Besides shared, GreenGeeks VPS hosting includes vast resources that can be scaled as per user need – thanks to flexible scalability. For more control and stability, developers can configure desired PHP version, access via SSH command line, create FTP connection, and utilize Perl/Python languages. For advanced programming environment, Git, WP-CLI, Drush, and Ruby also included. You’re also allowed to create countless email, FTP accounts, and MySQL. If you already have a website hosted on another host, then GreenGeeks expert staff will transfer your site with zero downtime at no additional charges. Moreover, exclusive PowerCacher, free CDN, Litespeed, and HTTP/2 feature plays a vital role regarding boosted efficiency. You might know that HTTP/2 protocol establishes quick SSL handshake between the server and SSL credentials to decrease loading time. The free cPanel software includes handy features like Softaculous, DNS editing, email address creation, and much more for your ease. PCI compliance and free shopping Cart installation making GreenGeeks eCommerce friendly as well. Beyond SSD storage at cheap rates, GreenGeeks allow unlimited domain hosting to its clients. Instead of multiple plans, they provide a single package in shared hosting category that packs with all the bells and whistles. Free domain registration is also given for the first year which is another $12/year saving. A2Hosting doesn’t rely on traditional HDD hosting instead all of their servers has SSD’s to deliver 20x faster data retrieving, low latency, and excellent user experience. The state-of-the-art infrastructure built with the latest hardware and updated software to achieve 99.99% uptime, data protection, and resource redundancy. A2Hosting was founded back in 2001 with the primary aim to provide fast hosting solutions at affordable price tag compared to the competition. I have a small niche blog with them; the speed is good and uptime also above the expectations. So, how A2Hosting successfully achieved an incredible performance and server reliability? As said earlier, they are using solid state drives for storage, but that’s not the only thing. The combination of cutting-edge hardware, latest PHP version, A2 Optimizer, Site Accelerator, Turbo servers, and HTTP/2 plays a vital part regarding improved loading time. You can also switch between different PHP versions. For maximum possible performance, I recommend choosing “Turbo” plan. It comes with exclusive features such as Turbo booster that increases 20x hosting speed. Starters looking for affordable best SSD hosting can select “Lite” plan which allows a single website, 5 databases, unlimited storage and bandwidth. It’s suitable for newly created blogs and business sites but for multiple domains “Swift” plan will be perfect. It packs everything but lacks Turbo feature. You can make use of any cache plugin such as W3 cache to further improve load time. However, A2Hosting also offer a custom version of W3 cache plugin that works out of the box. 24/7/365 customer support help you fix issues through live chat, email, and phone. There is also an intensive knowledge base section where you can find DIY guides. A2Hosting offer anytime hassle-free refund policy which means you can request to get your money back anytime. The pro-rated terms apply on the unused services so you’ll get the refund for unused credits. However, within the first 30 days after the date of purchase, they will return full refund. A2 Hosting is operating over one decade to address individuals and businesses needs ranging from small to high traffic sites and apps. With all essential features and bleeding performance, their prices are reasonable. All accounts accommodate restriction free data storage, bandwidth, and elite speed optimization tools as well as SSL certificates. Furthermore, anytime money back guarantee ensures the safety of your investment. The guru technical support is always there and one button away to help you 24/7. Here is Fastcomet, another company providing cheap SSD hosting at insanely lower prices starting at $2.95/month with 20GB Storage, 25k monthly visitors, and single domain name for the “StartSmart” plan. They are comparatively new in this business and operating for the last seven years. Fastcomet’s best in class infrastructure optimized in a way to load your blog under 395ms. The best part is they give you a free domain for the lifetime until you pay hosting bills. Currently, managing thousands of customers around the globe and 8 data center options to help users select an appropriate server near to target audience. You might know that picking the nearest instance reduces the load time drastically and enhance user’s browsing experience. The data center locations are Chicago, Dallas, Newark, London, Frankfurt, Amsterdam, Tokyo, Singapore. You can choose the suitable one according to your requirement at the time of sign up. The standard package packs unmetered traffic, cPanel, free Let’s Encrypt SSL, and CloudFlare integration. Fastcomet proudly presents free backups and BitNinja server security to maximize your content safety. They don’t charge any fees for backups either for restoration whereas many companies demand a hefty amount for that. All backups are stored offsite to ensure maximum security and retain according to your subscription like StartSmart 7 days and SpeedUp 30 days. If you want to have lightning-fast speed and highly optimized SSD shared hosting, then FastComet is the best solution. Regarding server specs, the “StartSmart” packed with 2 GB RAM, 2 Core CPU, and dedicated account isolation technology. Malware removal, Brute-force attack protection, Network firewall, 24/7 network monitoring, and CageFS security available for all users. No doubt, they are delivering reliable, stable, and secure hosting, yet, every plan also covered by 30 days money back guarantee. Personally, I have one blog hosted on FastComet’s shared server – the uptime, loading time, and stability is just awesome. I already tested through Pingdom, GTMetrix, and LoadImpact to check the stability. So far, results are incredible and make sense to go with them for reliable services. 24/7/365 instant customer support always there to help you out via live chat, email, and ticket system. Dreamhost is an award-winning web hosting company operating since 1996 and served millions of customers to launch websites and apps. They offer flash-based storage for shared, VPS, Dedicated, and Cloud hosting. With over two decades of industry experience, they are one of the oldest companies who also offer WordPress managed plans optimized for high performance and blazingly fast speed. Their shared SSD hosting not on cheap but also allow extensive web space as well as unlimited monthly bandwidth to manage as many domains as you can. That means you can set up all of your blogs on a single account hence save hundreds of dollars per year. Moreover, free SSL certificates by Let’s Encrypt also in place to enable HTTPS DreamHost is one of the few providers that are officially recommended by WordPress.org. Instead of widely used cPanel software, the company has developed its custom control panel that comes with dozens of user friendly features to organize hosting account. If you have used cPanel in the past, you might face some problems, but within the next few minutes, you’ll surely get familiar with. It’s designed by keeping in mind easy navigation and clean user interface. Shared hosting also includes the exclusive website builder named Remixer allowing drag and drop functionality to help non-tech users build their websites in a matter of minutes. The best part is it doesn’t require coding skills, so any business owner or individual having a little bit know how about webs can create their site without any problem. Which on the other hand ultimately reduces the cost of development. Though shared SSD web hosting is a bit expensive but you’ll get a free domain registration for one year alongside free Whois protection with yearly subscriptions. The prolong 97-day money back guarantee by DreamHost is another perk that shows how confident the company is about their services. Dreamhost has years of experience and serving millions of users around the world. Their customer gets cheap plans alongside unlimited domain hosting. Apart from that, you’ll also get a free domain name for one year. They claim to deliver guaranteed 100% uptime and offer account credits if failed to maintain it. With over 10 years of industry experience, TMDHosting is not a new name when we talk about solid state hosting providers. It was started in 2007 and now offering web solutions for leading CMS including WordPress, OpenCart, Drupal, WooCommerce, CubeCart, Prestashop, Joomla, and Magento, etc. You can create either an eCommerce store or personal blog with the help of one-click script installer comes with cPanel. They provide almost all kind of web hosting such as VPS, Windows, Dedicated, Bare Metal servers, Cloud, and Linux based servers built with SSD’s, Gigabit connectivity, hardware redundancy, 64 GB system RAM, Multiple fiber tier 1 backbones, and business-class hardware. On top of that, TMD has 8 data centers located in London, Chicago, Phoenix, Singapore, Amsterdam, Tokyo, and Sydney to ensure maximum performance and lower ping latency. Their shared SSD Linux hosting starts from $2.95/month (Starter) with free domain registration for the first year. There is no monthly bandwidth or data storage cap regardless of the plan you subscribe. However, for maximum resources and exclusive features, you should go with “Enterprise” plan. It allows unlimited domain names, 3x performance, Opache, Memcache instance, and Wildcard SSL. You’ll get beyond the expectation 16x faster page speeds and 99.9% uptime as well. Plus, real-time malware scanning and network monitoring perform on a daily basis by senior TMD staff for robust security measures. Spam Experts feature prevents against spam emails sent by untrusted peoples and marketing agencies, it automatically detects and takes necessary actions to avoid junk emails. You can reach the technical staff through chat, phone, email, and ticket system while there is also an extensive tutorials section. A 60 day money back guarantee in place – twice than BlueHost and SiteGround. Where most of the companies offer only Linux based hosting, TMDHosting also serves Windows-based solutions at affordable price. You can opt-in from both according to your application and blog need. As they use solid state drives so reliability and ultimate data protection are guaranteed. Regarding customer support, their expert representatives are always ready to assist you via multiple channels. Restriction-free storage and bandwidth, free cPanel, domain registration, and SSL are other perks. Agencies handling client websites can also try their reseller hosting. Blogs and websites getting enormous traffic and hosted on WordPress can go with following web hosting providers to avail dedicated managed solution for WP. They are the most reputed, well-known, and best-in-class services offering cutting-edge solutions for enterprises, giant brands, and high traffic individual blogs. If your primary aim to focus on productivity rather than technical aspects of your websites then managed hosting would be the perfect fit for you. When we talk about top-rated managed WordPress hosting, WPEngine might be the first name you think about (if you’re blogging for a while). They are utilizing cloud servers and offering dedicated hosting for WP CMS which means if you’re using Joomla or Magento, you’ll have to consider other providers. WPEngine’s state-of-the-art architecture built with bleeding edge technologies like SSD hosting, latest PHP, easy 3rd-party integration, and enterprise-level ecosystem. They are using world’s best class cloud platforms such as Google cloud, Amazon Web Services, etc. to deliver highly optimized managed solutions for WordPress. It also has award-winning 24/7 expert staff available through live chat, phone, and email to help resolve your problem in real-time. Staging, daily backups, pro-active threat monitoring, malware scanning, and 40+ technology integration for added performance. The “Startup” plan start from $35/mo packed with 1 domain, 25k monthly visits, free SSL, 3 staging sites, free migration, and much more alongside 60 day money back guarantee. Kinsta has integrated dozens of technologies for cutting-edge solutions such as latest PHP, NGINX, LXD Containers, DDoS protection, SSL certificate, firewall, and uptime monitoring to achieve best in class WordPress hosting. Their team will migrate your site at no additional fees with zero downtime if you’re planning to change your current host. The “Starter” package comes at $30 with 1 domain, 20k/mo visitors, 3 GB volume, free CDN, and SSL certificate by Let’s Encrypt. In a nutshell, it should be your top option for fully managed WordPress hosting built for ultimate performance and peace of mind. Last but not least, KnownHost is another best SSD hosting provider serving the customers since 2005 in more than 150 countries. It’s a privately owned and non EIG hosting offering shared cloud, managed WordPress, Reseller, cloud VPS, and fully-managed dedicated servers. They have four premium class data centers located in Seattle-WA, Dallas-TX, Baltimore-MD, and Amsterdam-NL. Shared cloud plans start at $3.47/month includes 5 SSD space, 5 domains, unlimited bandwidth, LiteSpeed feature, and standard cPanel. Managed WordPress hosting also priced reasonably and at the cost of $5.97/mo you’ll get 50 GB space, 1 domain, unlimited email accounts, and upto 100k monthly visitors. It also packs with WP-CLI, Staging, LSCache, BitNinja, Automatic updates, SSH access, SFTP, and 24/7 guru customer support. They don’t charge any fees for backups and site migrate – their expert team will transfer your data with Zero downtime guarantee. The company has bulletproof security measures as well as one month refund policy in place. Conclusion – Which SSD Hosting Should I Choose for Cheap Prices? Bloggers and content marketer having the primary goal to increase organic traffic and top SERP positions should consider high speed web hosting. Search engines especially Google give a little boost to fast loading sites compared to slow one. Two blogs having the same content but if one load faster than other, the quicker one will rank above. So, where you put hours to craft quality content not considering SSD storage is the worst mistake one can make. On the other hand, if you’re getting traffic through other sources like social network etc. (not search engines) then keep in mind, user experience also matters. No one like to visit slow loading pages. Your blog page should completely render under 3 seconds. It’s twice important for eCommerce stores as well – a single second of delay could badly impact the conversion rate. Users having low budget can choose SiteGround‘s cheap SSD hosting for 99.99% uptime guarantee, quick response time, and friendly support. They are one of the best customer support providers in the industry. 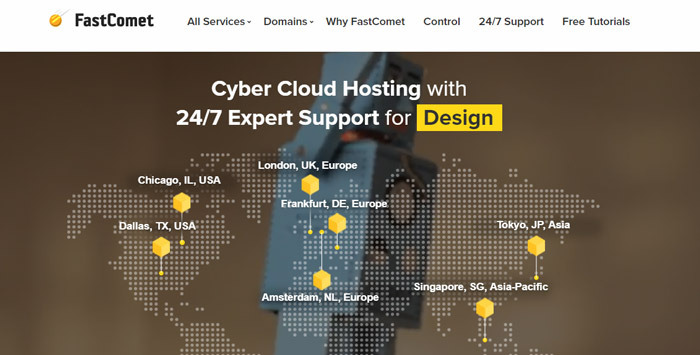 However, InMotionHosting also good to go, with 14-year top rated CNET certified award, they will surprise you with incredible services at affordable rates. Kinsta is my top recommendation for full-fledged managed WordPress hosting to host heavy traffic and large websites. With total peace of mind, their experienced team takes care of everything; auto updates to uptime monitoring, daily backups to free migration. Now, it’s your time to make the right decision and pick the best SSD web hosting as per your need. Still, have further any question? Don’t hesitate to ask below.